A dog must seek out and intelligently work likely cover. They must adapt to the birds and situation. For example, running pheasants must be worked smartly and sometimes aggressively, whereas a covey of sharptails will tolerate no pressure. Trainability and stability. Dogs that are of sound temperament, willing, and eager to work and train. Physical stamina to endure varied hunting conditions including terrain, temperature and cover. Erskine is one of the classiest Llewellin Setters we’ve known. He is long-legged and lithe, and he has a high, straight tail on point. He is the quintessential tri-color setter with a dark full mask and handsome top knot. Jeb is a statuesque English Pointer, with a playful temperament. He is the perfect combination of size and stature with muscle to spare. 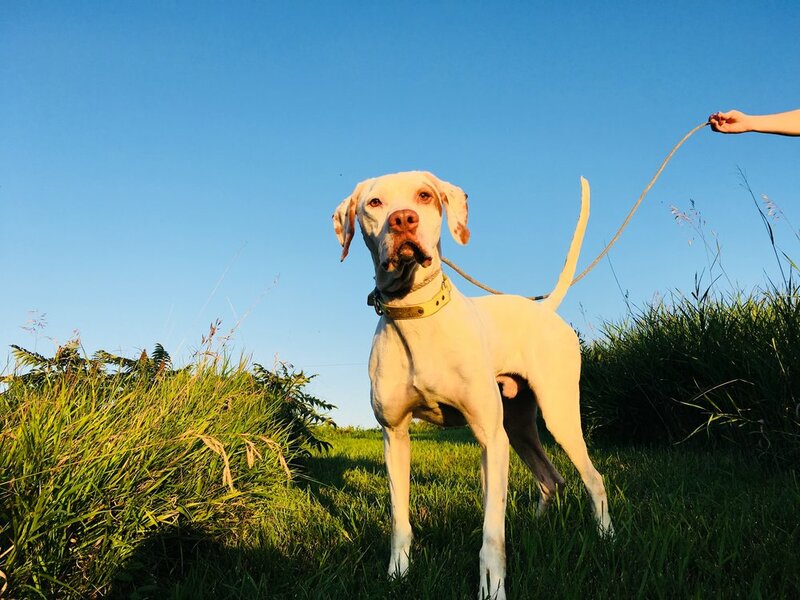 He can’t help but catch your eye with his clean white coat and high cracking tail as he streaks across the prairie like a bolt of white lightning. Tuff is the epitome of a gritty bird dog, and he is a well-framed Llewellin Setter. He is a heavily ticked chestnut tri-color with a dark full mask and handsome top knot. Gertie is a strong, athletic Llewellin Setter, with an affectionate temperament. She is deep-chested with a wide stance in her front legs, giving her plenty of room to run. She is a classic tri-color belton, and she has a high, straight tail on point. Penny is a Llewellin Setter that covers the uplands with class, and she loves to go to work. She is petite, but her deep chest and broad stance in the front give her incredible speed. Sky is a classy Llewellin Setter, with a serious, calm temperament. She has good size and holds her head high. She is a unique chestnut tri-color belton, with a half mask and a high, straight tail on point. Our retrieving dogs return dozens of ducks and geese as millions of these birds migrate over our home in the middle of the Central flyway each fall. Rob typifies the British Labrador Retriever with impeccable line manners and handsome good looks. He has one of the winninest British lab pedigrees in North America, and he really came into his own when we began running hunt tests in 2018.